Eugene “Lou” Filla, 88 , of Washington, passed away on January 13, 2019 in Washington. Mr. Filla, son of the late Gustave Filla and wife Julia NEE Bleckmann, was born March 31, 1930 in Washington. He received his education from St. Francis Borgia High School. On October 4, 1958, he was united in marriage to Dorothy Heuser at St. Francis Borgia Church. Mr. Filla was employed by Jefferson Products for 39 years. Lou was a member of the Washington Fire Company, St. Joseph Infirmary, Buds Baseball Organization, Buhrs Club, Knights of Columbus, and a past member of the Washington Elks Lodge. 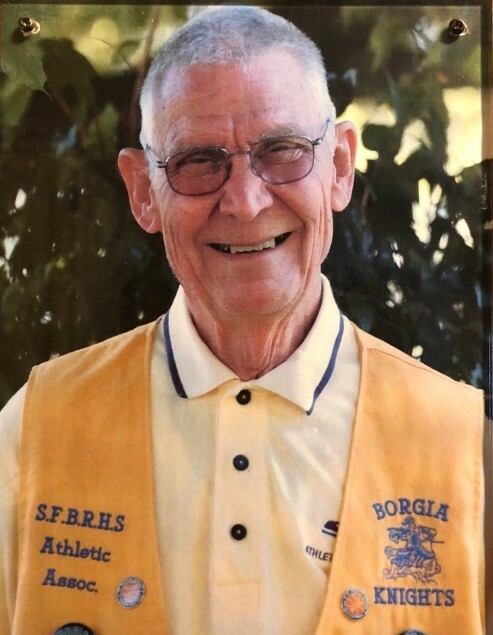 Lou loved hunting, fishing, and especially volunteering his time at the Pregnancy Assistance Center and at St. Francis Borgia Regional High School helping with all of the athletic events. He was a member of St. Francis Borgia Church, where he also served as an usher. Mr. Filla served his country honorably as a member of the United States Navy. Lou was preceded in death by his parents; sister, Rosemary Freitag, and two brothers, Anthony and James Filla. Among his survivors are his wife, Dorothy Filla of Washington; two sons, Gary Filla and wife Mary of Washington and Kurt Filla and wife Anneleisa of Grand Rapids, MI; sister, Mary Lou Wunderlich and husband Roman of Washington; eight grandchildren, Mia and River Filla, Dylan, Catherine, Margarite, Zachary, Xavier, and Blaise Filla; sister-in-law, Maryann Goetze of Memphis, TN; other relatives and many friends. A visitation will be held on Tuesday, January 15, 2019 from 4-8 P.M. at Miller Funeral Home. A Mass of Christian Burial will be held on Wednesday, January 16, 2019 at 10 A.M. at St. Francis Borgia Church, with interment at the St. Francis Borgia Cemetery with full military honors. Memorials to the St. Francis Borgia Church, Pregnancy Assistance Center, or the St. Francis Borgia Regional High School Athletic Association are preferred.